Our Merlot is a blend of Estate Merlot and Estate Cabernet Sauvignon. The percentage of Cabernet Sauvignon ranges from 12 to 18 percent depending on the vintage. The grapes for this wine are picked in very small amounts as each area of the vineyard reaches its peak of ripeness. The grapes are then de-stemmed and the individual berries cracked open by our 20-year-old Healdsburg stemmer/crusher (with the crusher rollers removed) and fermented in small open top fermenters or small stainless steel tanks. After fermentation the pomace is gently pressed in an old fashioned basket press and each pick is put into a stainless steel tank to settle off the gross lees. The wine then goes into our new or used French oak barrels for 19 months of barrel aging. 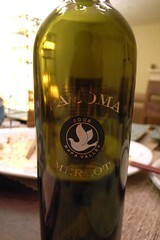 The resulting wine is a big, world-class red wine capable of improving with bottle aging for 10 to 15 years in most vintages. Although the wine varies with the vintage, they have a consistent thread of complex aromas of black berry fruits, black stone fruits, chocolate, tobacco, spice and floral notes with a mineral overtone. On the palate the wine has a big silky mouth feel, well balanced, with flavors of berries, fruit, cocoa, cassis, and spice, and a long spicy finish. Fruit tannins in our wines tend to be big, but not harsh and are well integrated with the strong fruit component.